Very rare vintage Bollywood poster for sale of the cult Guru Dutt film, Sahib Bibi Aur Ghulam (1962). This is an actual surviving old Bollywood poster for sale of the 1962 classic Hindi film that featured one of the greatest filmmakers of Indian cinema, Guru Dutt in the lead role opposite actresses Waheeda Rehman and Meena Kumari. Based on a Bengali novel, Shaheb Bibi Golam by Bimal Mitra, the film was a massive critical and commercial success and has over the years garnered cult status. Meena Kumari’s performance as an alcoholic lonely wife in the film is often credited as one of the finest acting performances in the history of Indian cinema. Sahib Bibi Aur Ghulam won four Filmfare Awards, including the Best Movie award and was nominated for the Golden Bear at the 13th Berlin International Film Festival. The film was also chosen as India’s official entry to the Oscars, making this Guru Dutt poster highly collectible! Printed and circulated somewhere in the 1960s, this old Sahib Bibi Aur Ghulam poster was originally designed for publicity of the film but never ended up being used. This beautifully hand painted Bollywood poster features a stunning portrait of Guru Dutt and actress Meena Kumari locked in a passionate gaze on the top. A vintage alcohol jug at the bottom overlapping Meena Kumari’s portrait suggests the plot of the film – a complicated triangle of relationships between a lonely alcoholic wife, her wealthy husband and their servant. 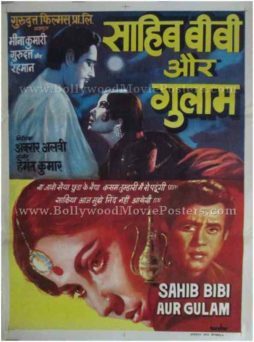 Very rare original old Bollywood poster of the hit Guru Dutt film, Sahib Bibi Aur Ghulam poster (1962) for sale. This is an actual surviving vintage Bollywood poster of the 1962 award winning Hindi film that was produced by one of the most influential filmmakers in Indian cinema, Guru Dutt. Sahib Bibi Aur Ghulam featured Guru Dutt in the lead role along with Meena Kumari. This is an extremely rare Bollywood movie poster that depicts Meena Kumari lying in a drunken stupor, at a time when women drinking alcohol was regarded as a taboo in Indian culture, making this poster highly collectible. Sahib Bibi Aur Ghulam was a stellar success and Meena Kumari’s performance as an alcoholic lonely wife is considered one of the finest performances in Indian cinema till date. The film features in many top ranking lists that have been compiled over the years and is unanimously regarded as a must see film in Bollywood. Printed and circulated somewhere in the late 1960s, this old Bollywood poster was originally designed for publicity of the film but never ended up being used. This artistic hand painted Bollywood poster features stunning portraits of Guru Dutt & Waheeda Rehman at the top. 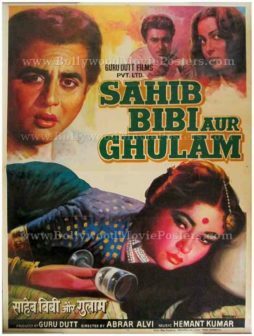 Painted by popular Bollywood poster painter Shrikant, the bottom of this Sahib Bibi Aur Ghulam poster features an interesting hand painted portrait of Meena Kumari holding an empty alcohol glass in her hand. This old Meena Kumari poster has been printed on thick stock paper and features block overprinted typography used in the movie title. Sahib Bibi Aur Ghulam is a 1962 Bollywood movie produced by master filmmaker Guru Dutt. The film stars Guru Dutt, Meena Kumari, Waheeda Rehman and Rehman. Sahib Bibi Aur Ghulam is based on a Bengali novel, Shaheb Bibi Golam by Bimal Mitra. The novel (and the film) tells a story about the complicated triangle of relationships between a lonely wife, her wealthy husband and their servant. Sahib Bibi Aur Ghulam won four Filmfare Awards, including Best Movie award. The film won international acclaim with a Golden Bear nomination at the 13th Berlin International Film Festival and became India’s official entry to the Oscars.